It has been known that flow control valves are used to regulate the flow rate and fluid pressure in a wide range of systems. The most basic kind of flow control valves consists of a changeable aperture, which closes to slow flow rate or opens to increase the flow rate. Such valves are designed to deliver constant flow, and they operate based on the principal that such flow will be delivered if there’s a constant head loss (resistance to flow) across an orifice. This orifice was created for the function of delivering the required flow at a known head loss. There is this flow control pilot that observes the head loss across the orifice and modulates the valve to keep it constant. So, if the head loss is too high, the flow control pilot closes the valve; if the head loss is too low, the flow control opens the valve. Control valves are being used because it provides an inexpensive solution to many concerns related to flow control. Typically, they are used on pipelines delivering water to multiple users to ensure that sufficient flow is distributed. They are made of brass, carbon steel, stainless steel, synthetics, and zinc. One of the many types of flow control valves includes one-way flow control valves. Let us discover its functions and varieties. This type of flow control valve regulates the piston speed of pneumatic drives throughout the execution of return and advance strokes. This is done by suitable restriction of the compressed air flow rate in supply air or exhaust air direction. With this type of control valve, there is only one direction where the flow control works. Exhaust air one-way flow control function. There is an actual speed adjustment through the exhaust air flow control. What moves the piston between air cushions are the uncontrolled supply air and controlled exhaust air. This improves motion, and even with load changes. Supply air one-way flow control function. Adjustable speed is present during the advance and return strokes. The flow rate is the same in both directions. Flow control function in both directions. Speed adjustment on both sides through flow control is often implemented in cases of small or single-acting cylinders. Exhaust air and supply air one-way flow control function. The flow rate can be adjusted in varied ways in both directions. And the speed during the advance and return strokes are adjustable. 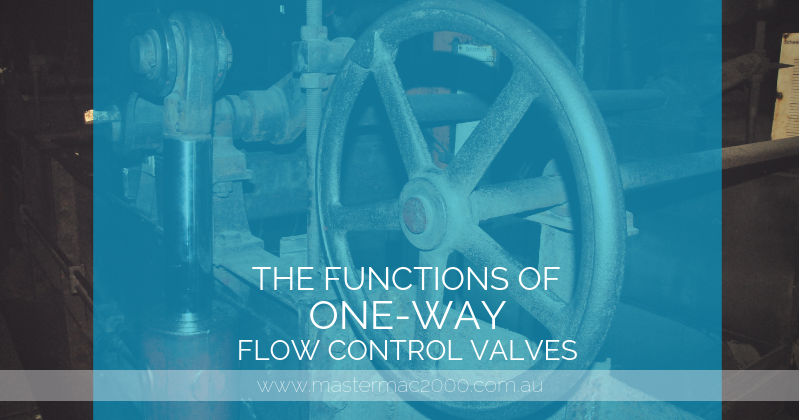 To learn more about one-way flow control valves, contact us at Mastermac2000.com.au.